A Questions & Answers family game produced by Imagerie Pellerin, Épinal, France, c.1840. 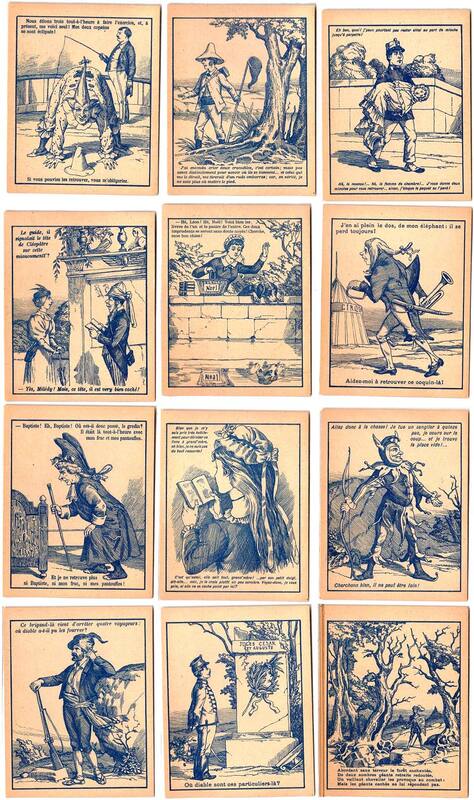 Pellerin was a celebrated publisher of popular art, including playing cards and games. In 1796, Jean Charles Pellerin had set up the Imagerie d’Epinal and popularised printed images of everyday scenes. Épinal, France is best known for the Images d'Épinal, the popular prints created by Imagerie Pellerin and the Pellerin family. These hand-coloured woodcuts or lithographs of military subjects, storybook characters and other folk themes were widely distributed throughout the 19th century. Pellerin ended up becoming the leading French firm in the field of popular imagery and also published playing cards and tarots. 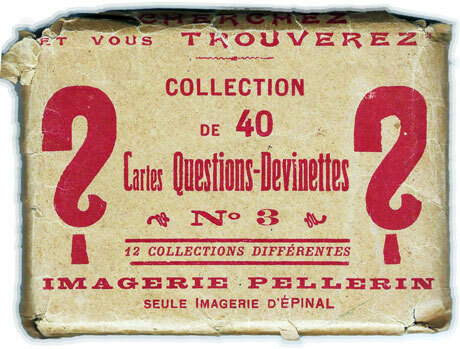 Right: outer wrapper, printed in red, which mentions that the set contains 40 cards and is no.3 out of twelve different collections. The cards themselves are printed in blue and are uncoloured. The cards are also designed as optical illusions, and hidden images or faces appear depending on how you look at the drawings.